and transportation for fine art, and art of all types. Cunningham Art Services offers a huge selection of frame samples in our shop, and our staff is experienced in the safe handling, presentation and preservation of your fine art, as well as your personal treasures. We provide turnkey commercial and residential framing, and installation project management with personalized customer service for all our clients. We are fully insured including fine art insurance, and your artwork will be stored in our own secure, climate controlled building with a monitored security system. Over 30 years of framing, displaying, and installing artwork for Houston's business community. We work with local, national, and international art galleries, museums, law firms, government entities, schools and colleges, religious institutions, banking and investment firms, interior decorators, commercial real estate managers, commercial art consultants, restaurants, and many others. We can operate as a hub for managing corporate art projects, as well as gallery and museum shows. We can deliver a fast turnaround for urgent needs. We provide options to lower costs on business projects. We don't sell any artwork, retail, or ready-made products, so we don't compete with our business clients. We are fully insured, including fine art insurance for valuable collections. Valuable art collections, family photos, treasures and mementos, sports memorabilia, taxidermy, and anything else you can think of! Cunningham Art Services has provided museum quality framing, display and installation solutions for the greater Houston's area residents since 1984. Our very experienced design team provides a creative and personal experience for all of our customers and their artwork. Our installation team has seen it all when it comes to installing artwork and personal items in home, so bring us your ideas and we'll make them happen! In every way, our staff is like a family (because in some cases, we are family). 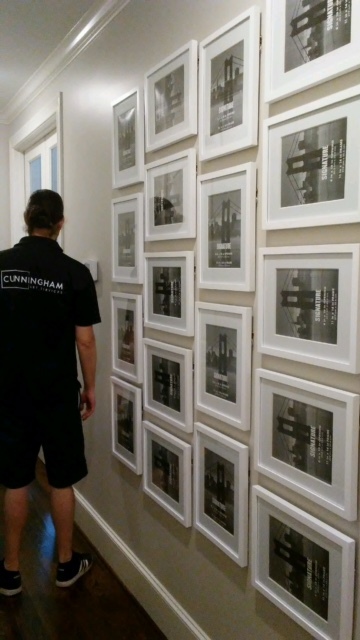 Rare as it is these days, some of our staff has been with Cunningham Art for 14 and 20 years. In addition to everything else we offer, we provide consistency, familiarity and the experience that comes from calling on our trusted professionals year after year.